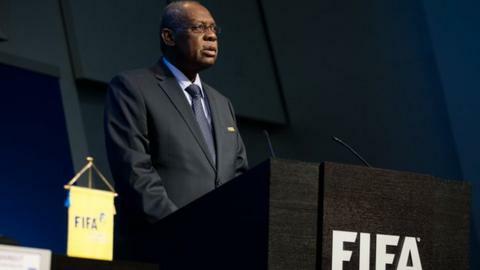 Football deserves "nothing less" than a rebuilt and fully accountable Fifa, says acting president Issa Hayatou. World football's governing body has been engulfed by claims of widespread corruption since summer 2015. As a result of criminal and internal investigations new reform measures were approved by Fifa in December. "There may be more challenges, and it will take time for the reforms to take effect. Our resolve to rebuild Fifa for the better remains steadfast," he said. "The hundreds of millions of fans, players, coaches and others dedicated to football around the world deserve nothing less from those of us with the incredible responsibility and privilege of governing and guiding global football." • A clear separation of powers between the political side of global football and the day-to-day financial and business operations of Fifa. All financial transactions will be monitored by a fully independent body. • Member associations must mirror the above structure and comply with principles of good governance. They will also be accountable for the conduct of their entire team and any third parties that they work with. • Strict term limits for senior positions within Fifa of three four-year terms will ensure that no single person can wield too much power or influence. • To promote the full participation of women at all levels of football governance, including a minimum of one female representative from each region in the new Fifa council. • Central integrity checks by an independent body for all appointments to Fifa bodies and senior management. Read the open letter in full. Meanwhile, suspended president Sepp Blatter said he "did not violate Fifa's code of ethics" as he made his defence to Fifa's ethics committee on Thursday. The Swiss, 79, is under investigation on suspicion of criminal mismanagement and misappropriation of funds at Fifa, but denies any wrongdoing. He was suspended on 8 October from all football-related activity for 90 days. Michel Platini, the president of European governing body Uefa, was also banned from football. His case will be heard on Friday. Fifa is investigating allegations that a £1.35m payment was made in 2011 for work Platini did as Blatter's adviser. There was no written contract for the payment for the consultation work, which Platini received nine years later. "President Blatter looks forward to a decision in his favour, because the evidence requires it," Blatter's lawyer Richard Cullen said. "The evidence demonstrates that President Blatter behaved properly and certainly did not violate Fifa's code of ethics. This investigation should be closed and the suspension lifted." The adjudicatory committee intends to announce its verdicts before Christmas, with announcements possible as early as Monday.